This set brings back fond memories of my youth when I managed to acquire the complete Incidental Music to Beethoven's 'Egmont' and recall being totally bowled over by Szell's majestic interpretation of the Overture. 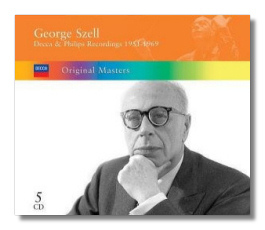 I also possessed a scrawny sounding tape recording of the Dvořák G Major that was similarly fascinating, and another LP of the Handel excerpts completed by Szell/Decca collection, so I was allowed to approach this set with some elements of nostalgia. We now have a host of similarly thrilling recordings that the great Hungarian-American maestro made for Decca in the 50's and 60's. Pride of place obviously goes to the 'Egmont' excerpts that are quite majestic and thrilling, especially in the concluding melodrama. A similarly taut and classical reading of Beethoven's 5th with the Concertgebouw Orchestra makes up the rest of the first disc which is commendable indeed. I was not familiar with Szell's Mendelssohn, but on the count of these recordings of 'A Midsummer's Night Dream', you would be surprised how much energy and charisma is brought to this gossamer like score. The Tchaikovsky 4th Symphony is also pretty overwhelming in its sense of power and forceful drama with the London Symphony playing quite magically for Szell. Schubert's 'Rosamunde' is full of colour and magic whilst the Sibelius 2nd is another powerful reading, very much moulded in the classical tradition and benefits from the magnificent playing of the Concertgebouw Orchestra. The Handel pieces are in the grand manner but are thrilling and exciting just the same. Mozart's Symphony #34 is also rather taut and restrained but there's no denying the conductor's perfect temperament on all counts. The final disc pairs two great classical and romantic symphonies in the shape of Brahms' 3rd and Dvořák's 8th. Although the recordings are in mono and date back to 1951, the sound is pretty astonishing for its age and the interpretations are true classics of their time. I actually prefer this version of Dvořák's 8th compared to Szell's remake of this classic work with the Cleveland Orchestra (also in my collection). To sum up, this is a set that oozes greatness and is a must purchase for all historical enthusiasts.